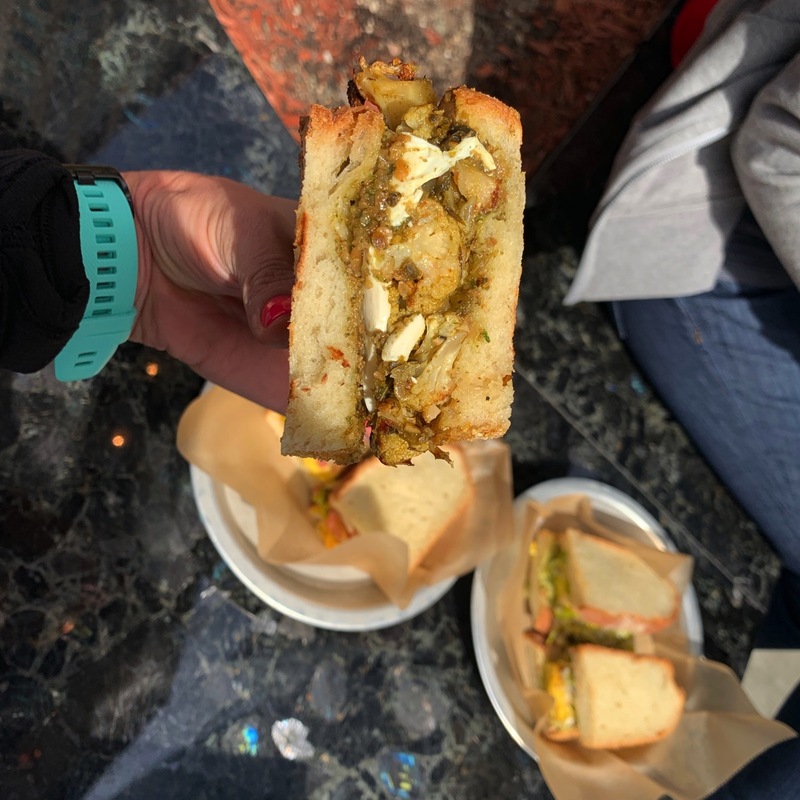 Today’s post is dedicated to all of the things I haven’t told you about from this last weekend yet! * DEENA and me! I didn’t want to wash my right arm after this below picture was taken. Her book (here) changed my running in so many ways. I just think the world of her. Deena is the best example of showing how much our thoughts can serve us. 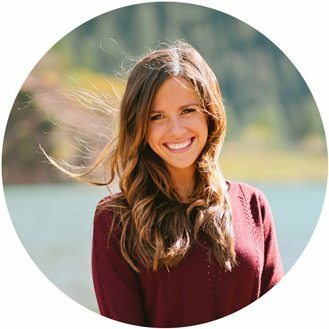 When she told us we have 50,000-70,000 thoughts a day it really made me realize how much we control the way we think about ourselves and the world. That is a lot of thoughts each day and the things we choose to think about can sure take us in two very different directions. She said, “our brains are malleable and they need your steering.” I wonder how many thoughts we have during a marathon? She also talked about her response when people ask if she is going to continue running and racing forever. She said something like this—> Of course! Running is a lifestyle, it’s a way to flex your mental strength muscles and bring yourself to challenge and flex your optimism muscle so that it doesn’t atrophy! <— I love this. *Andrew and I decided we need to take mini trips together more often just the two of us. We’ve had kids from day one of our relationship so having a day or two or three just the two of us was amazing for us. It was so nice to get out of the routine of life and focus on each other! 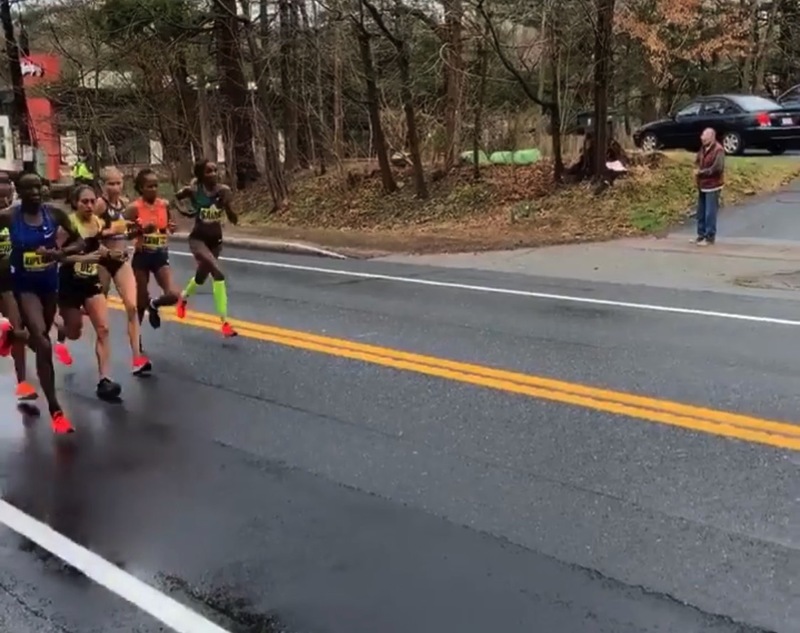 *Andrew saw the lead pack of women go by at mile 8. He cheered on Des and SHE LOOKED at him (you can see in the IG video that he posted). How cool!? 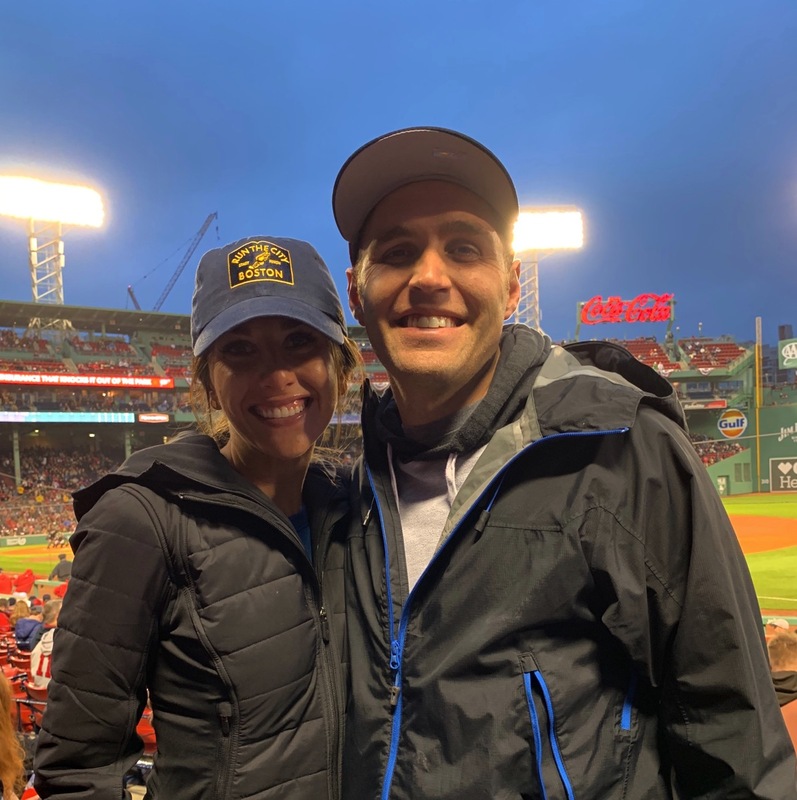 *While we were watching the Red Sox play on Friday night it had me thinking about how awesome it is that in running we get to be in the same arena as the pros/elites doing the same race. We get to follow behind them on their playing field during their biggest races and I love that. That doesn’t happen very often in different sports! On Monday I loved thinking about how I was just a few hours behind some of my biggest heroes. 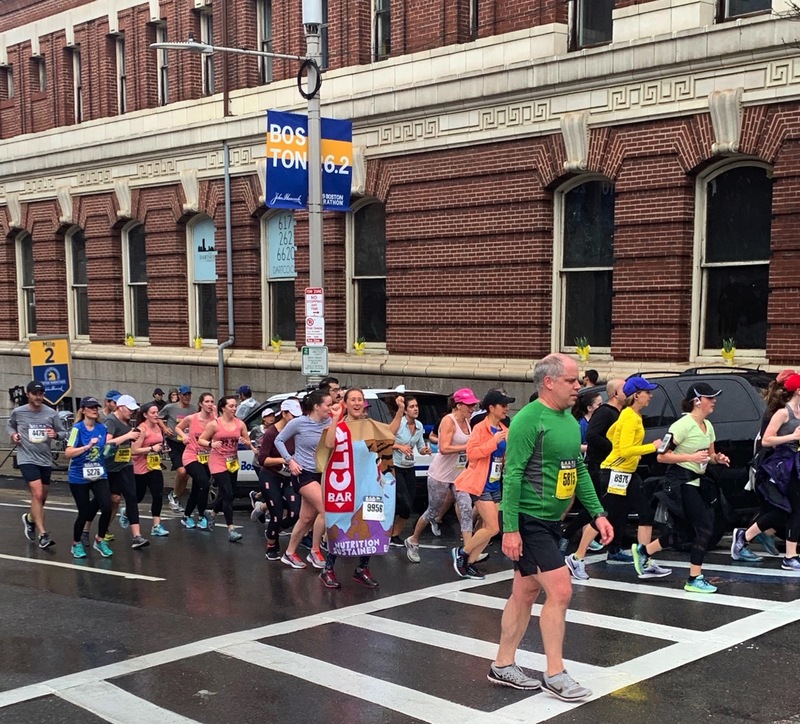 *During the BAA 5k I saw this girl dressed up as a CLIF bar and I thought it was awesome. *I met Ellie (Ali’s dog) while we were in town and Brooke is very jealous. I also met Annie (Ali’s 6 month old) and she is the cutest little thing! *I tried Shake Shack for the first time and I don’t want to be offensive but I didn’t love it… it was food but nothing to write home about. I’M SORRY! PS we ate here one night because the wait for everywhere else was almost 2 hours (we didn’t plan Saturday night very well). 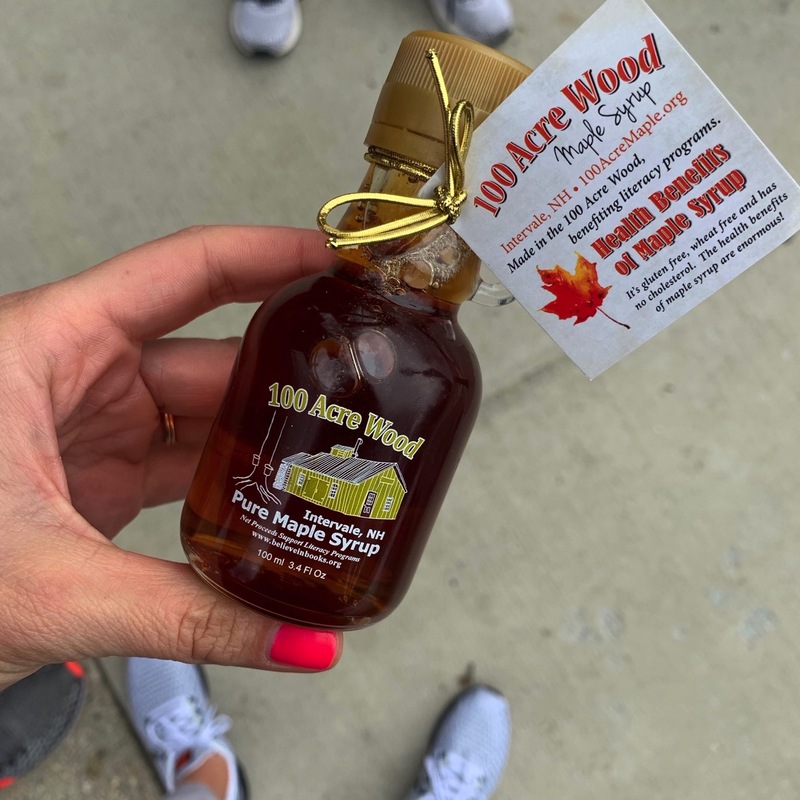 *At the meet-up Jen brought me this maple syrup to take home. I made pancakes yesterday just so that I could try it. Verdict= Incredible. 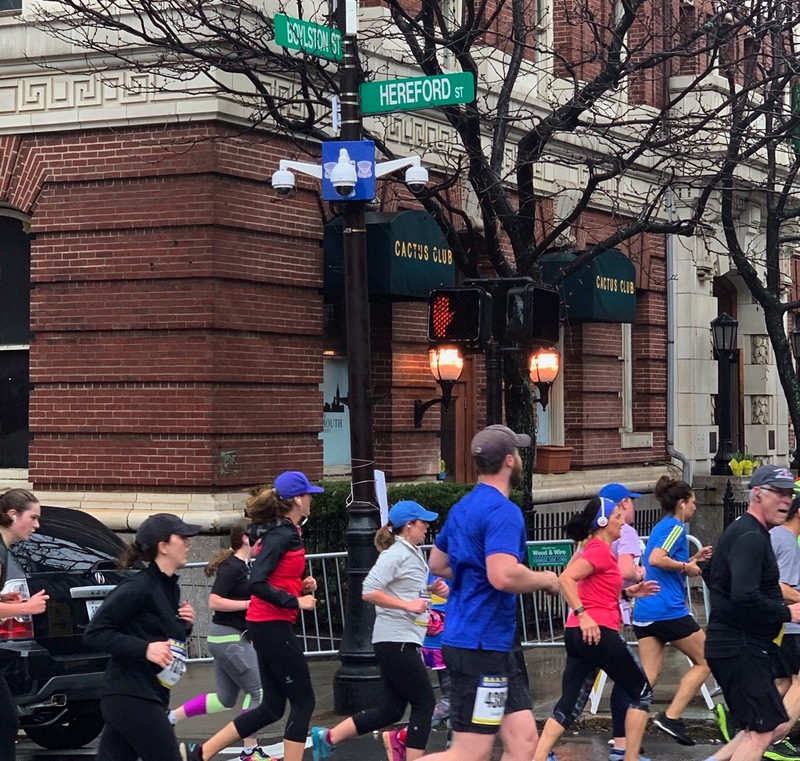 *Picture from the BAA 5k but goodness gracious it felt cool to see the Boylston/Hereford signs on Monday. *From here on out I am just expecting you guys to tell us all of the places we need to eat whenever we travel. We went to a lot of the places that you recommended and they were all amazing. Thank you. JP Licks was so good. 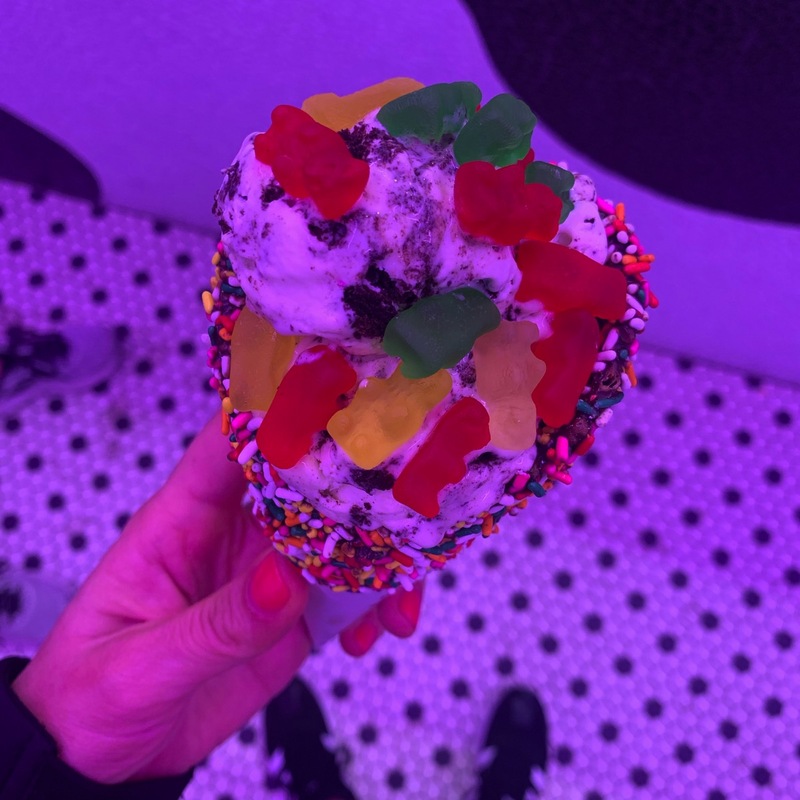 And I am very sorry that I have gummy bears on my cake batter/oreo ice cream but I promise it was good. *You also told me to go to Flour and WOW. I’m drooling over thinking about this cauliflower sandwich. *My new favorite pair of goodr glasses. Over the weekend I realized that my love for marathon gear collecting is very similar to Knox’s love of Pokemon collecting… YOU CAN NEVER HAVE ENOUGH. 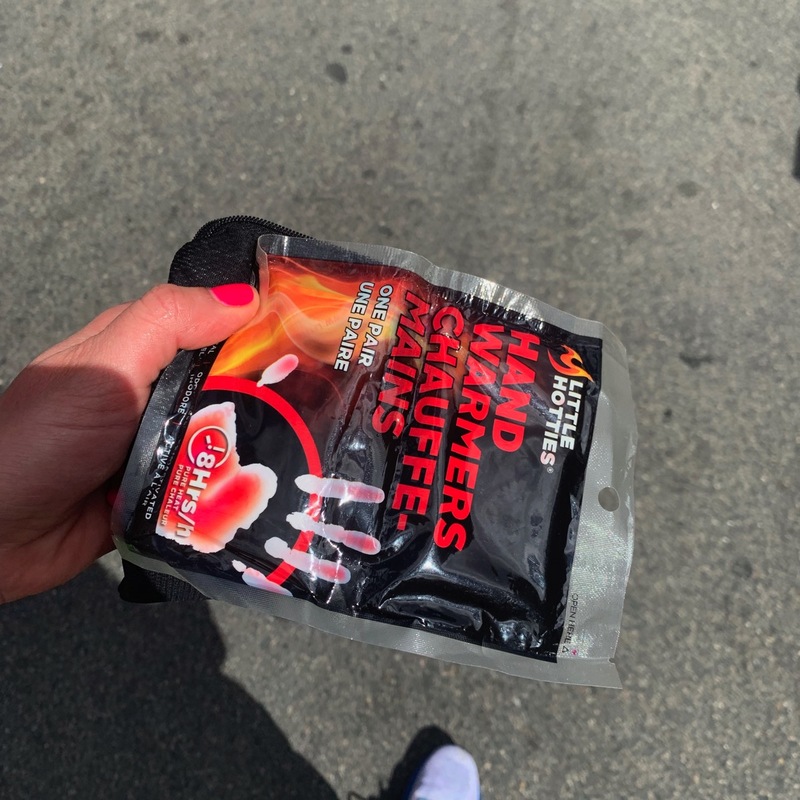 *At the end of the marathon I realized that these hand warmers were in my Koala Clip for the entire race. I was nervous it was going to rain or be cold at some point and I would need them but there was definitely NOT a need for hand warmers on Monday ha. *There was a need for a robe in the morning. I love bringing blankets to the waiting area for races and this robe (that I got for free a few years ago and never really used) was perfect too. Plus it was quite fashionable. 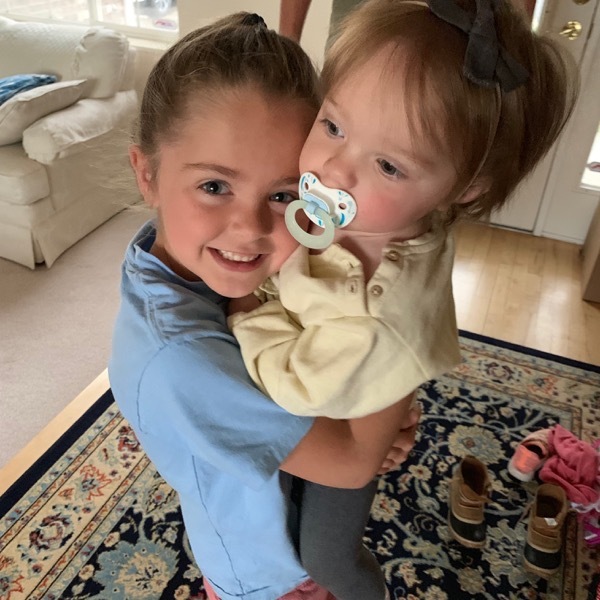 *Skye had the best time with my sister-in-law. She sent us pictures the entire time too and it was the best to get all of her updates. We were worried she wasn’t going to want to come home after this weekend ha. *Joan Benoit Samuelson ran a 3:04:00! She. Is. Amazing. 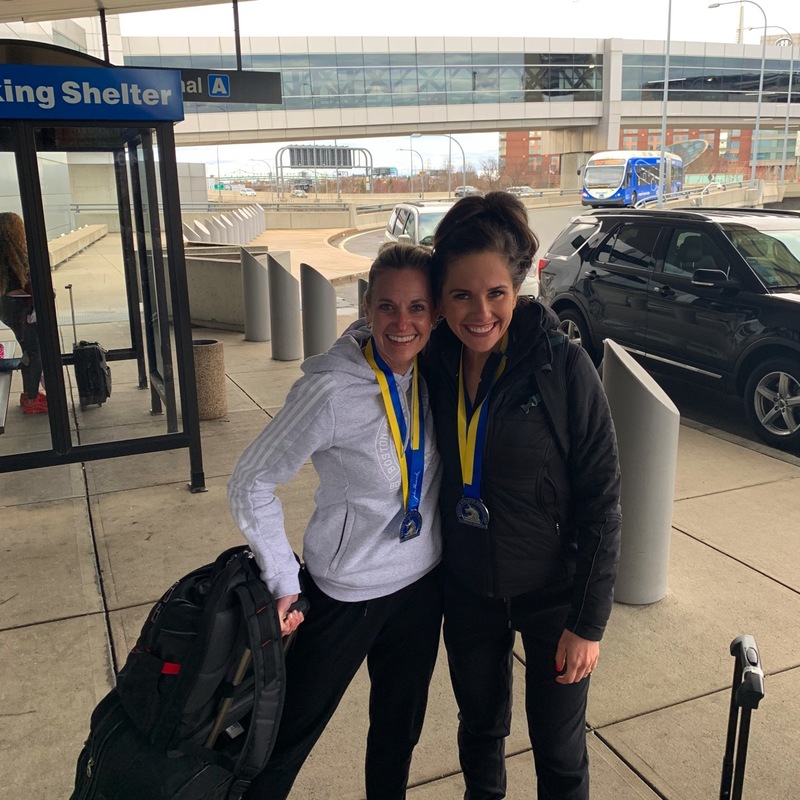 *Candice and I have decided that the post-marathon-airport-picture is our Boston tradition now. *Speaking of Candice, she put Dove Deodorant all over her feet before the race and it prevented blisters for her. That stuff is magic… chafing and blister prevention?! *Burger and fries after the race and then the saltiest soft pretzel at the airport on Monday= the best. I almost had Andrew stop at McDonalds for fries when we got back to Utah at like 2 in the morning but instead I waited for those fries until the afternoon. LOCAL READERS!!! 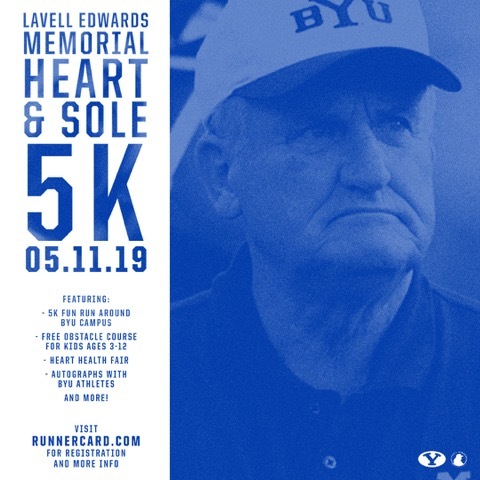 Check out this awesome run going on at BYU. We will be there with the kids running it and I hope to see you there. You can register HERE (this is a race my brother-in-law is working on putting together so come come come)! May 11th at 8:00 at the BYU Track & Fields! Have anything you love to collect? If you have children, do they love to collect anything? 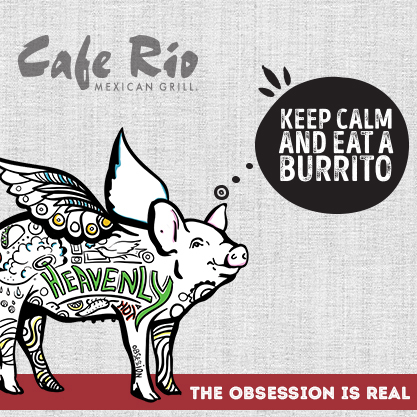 Any restaurants that a lot of people seem to love but you don’t feel the same way? Who has a dog? What is their name? Some tempo miles during a long run and we really like Saturday nights. We sure know how to party and I am obsessed with running clothes. Girl, I just gotta say that reading yesterday’s recap was a WAAAAAAAAAAAY different experience than reading your recap from 2015. While you always focus on positive reflections throughout your day, the spirit in which you wrote (and seemed during the race, from yours and Andrew’s insta stories) was off.the.charts. I was SOOOO giddy FOR you! I have a shorty three-miler on the books for today with Windy (named for her birthplace, Chicago), my Siberian Husky (Hooray for a twofer question-answer!). I totally agree with you… the two experiences were night and day for me too! Thanks so much Tiffany, that means a lot. Hahah two in one questions answered. Have fun with Windy (love her name) and ps Brooke wants a husky so so bad. Have a great day! I also love the idea of a mini vacation without the kids. My husband and I haven’t even had a date night in like, a year. We’re so bad at letting life with the kids and jobs and stuff get in the way. You and Andrew made it look so enjoyable! My son collects bouncy balls. He’s two and OBSESSED. They are EVERYWHERE. But if I can’t find the exact right one…oh boy. haha. I can’t imagine 2018 but I know Boston is ready for you to come back! I hope you guys get a date night in soon! Two and obsessed with bouncy balls, I love him! Have a beautiful day Mollie! 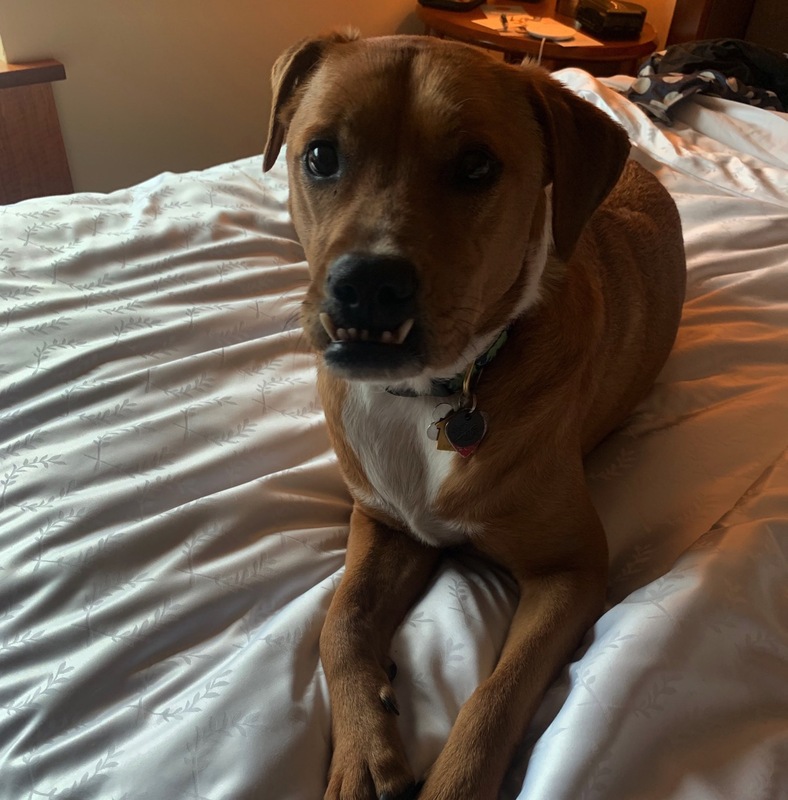 So glad you got a ton of great noms in Boston – I love it there so much! 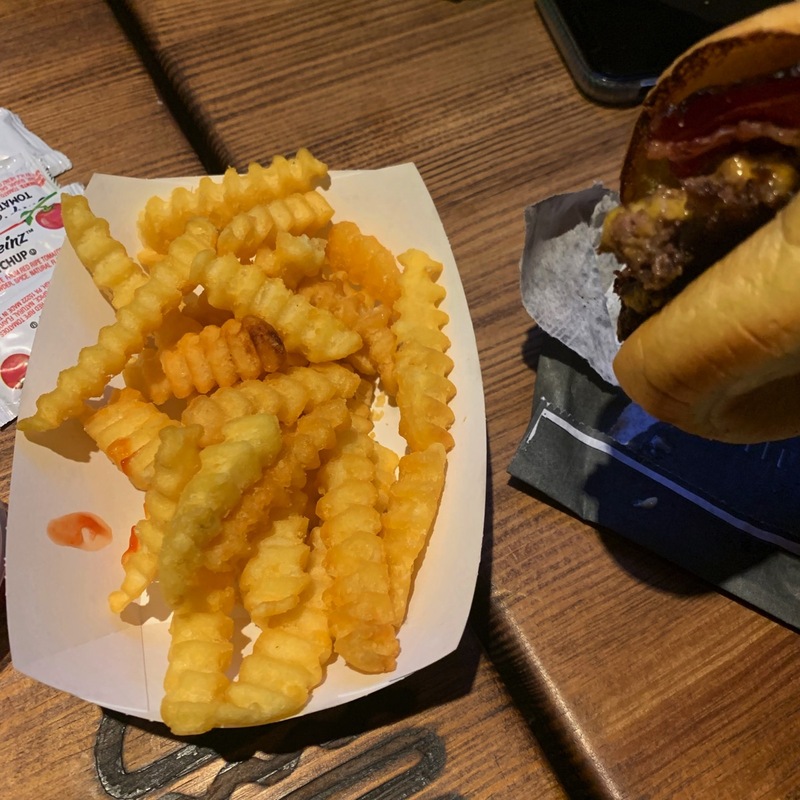 Shake Shack’s burgers and fries aren’t all that great, I like their frozen custard but it’s not as good as Culvers (you have Culvers in Utah, right?) and definitely not as good as the local custard places in Milwaukee. Though, there’s a Shake Shack 4 blocks from my office and I’ve been twice, ever, so…guess I don’t really like it all that much. Hmmmm maybe I need your peeps to give me food recs for Spain and Portugal haha. Emily just sent me the most awesome list of recommendations for your trip! We do have Culvers which is so yummy. Thanks for your help and I literally am dreaming about that hot chocolate! So cool that you got a pic with Deena! I went to chick-fil-a for the first time last weekend and I was not impressed. I got a salad so, there’s that. Not exactly what they’re known for or what people rave about but still….not the best. I was completely impressed with their service though and I love all of the good things they do and what they stand for. My kids both collect Pokémon. Still. For years. When will it end?! I lifted this morning so no run today. Yesterday though I ran .4 extra miles to get to a port-a-potty that is no longer there. I think Parks and Rec needs to start making alerts to local runners whenever port-a-potties are moved or removed. I have a cavapoo named Ginger. She is 7 pounds of pure snuggle. OH NOOOOOOO I am so so sorry that you didn’t like it! Did you try their special sauce? Hahaha I collected Pokemon too when I was a kid! Oh they really need to let us know, we need to be in the loop of these things! Ginger… I need to meet her! I ran a 6 hour ultra on Saturday and it went great. We had fantastic weather, and everyone was extremely friendly. You had to do a 2.2 mile lap course, and I ended up first woman with 16 laps, so 35.2 miles in 5 hours, 45 minutes.. I haven’t run over 8 miles at a time (or 20 miles in a week) since last summer, so not too shabby! haha. There is a lot to be said for muscle memory (and again, optimism!). I’m glad you had such a fun time at Boston. I love that race! Are you kidding me? You did that after not going over 20 miles in a week (or 8 miles at a time) in a year. Stacey, you are so physically and mentally strong. I’m amazed by you! Keep inspiring me! Thanks you and let’s keep exercising that muscle. Have a great day and recover well! Awesome job at Boston, loved IG stalking you all weekend!! Hey, any specific dove deodorant for chafing? I have my 1st Ultra in 2 weeks so chafing is definitely on my mind!!! 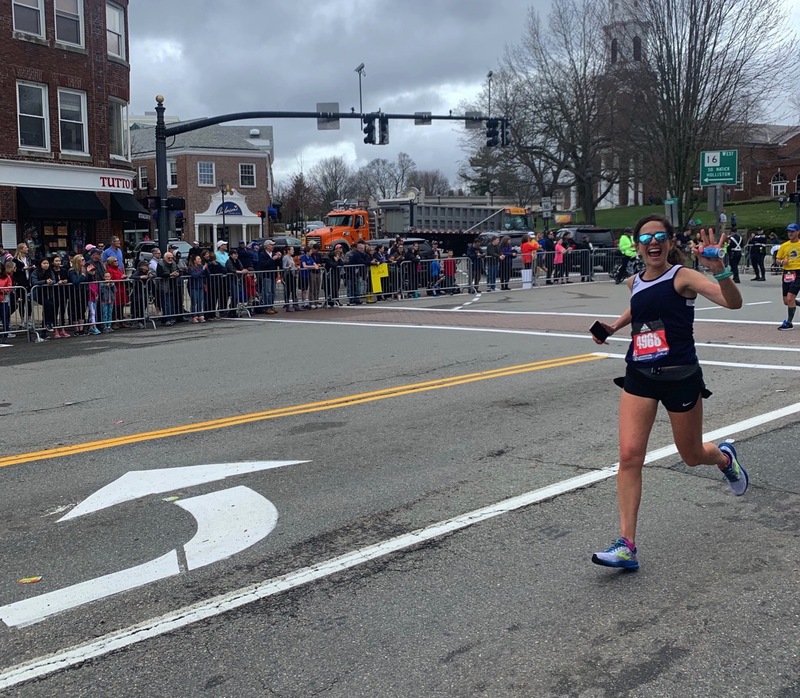 Congrats on having a fun, relaxing Boston marathon! I live in NY, the land of Shake Shack, and I’m not a huge fan. Not too big on In N Out, either. Basically, if I’m going to have a burger, I’d prefer to make it myself. Failing that, I’m a Bareburger person, because they have bison burgers. If Victoria, who commented above, wants recs for Lisbon or Porto, I can help! I need to try Bareburger! I’m with you.. Shake Shack and In N Out don’t do it for me either. SHE DOES WANT THOSE RECOMMENDATIONS! I’m so excited for her to go. Thanks Emily! I saw Andrew’s video of Des looking at him! It was awesome!!! Taking little trips, just the 2 of you, is so important! My husband and I try to do that at least twice a year. Our kids are older now, but even when they were little, we would get a little getaway in. It helps you keep your marriage strong and I’m focus…and, we will be celebrating 25 years of marriage this summer! I love that you got to meet Annie and Elli! Oh, and I would love to meet Ali! Oh and Dena…the best! Thank you for sharing your weekend!! Wasn’t it cool how she looked over? I LOVE that you and your husband do it… it’s necessary! HUGE congrats on 25 years this summer. You would love Ali so so much and maybe someday we can all get together! Have a wonderful day Wendy! I’m with you on Shake Shack. I don’t get all the hype. But now I want fries! Well go to McDonalds, Five Guys or Chic Fil A for fries haha:) . You are not alone! Have a beautiful day Samantha! 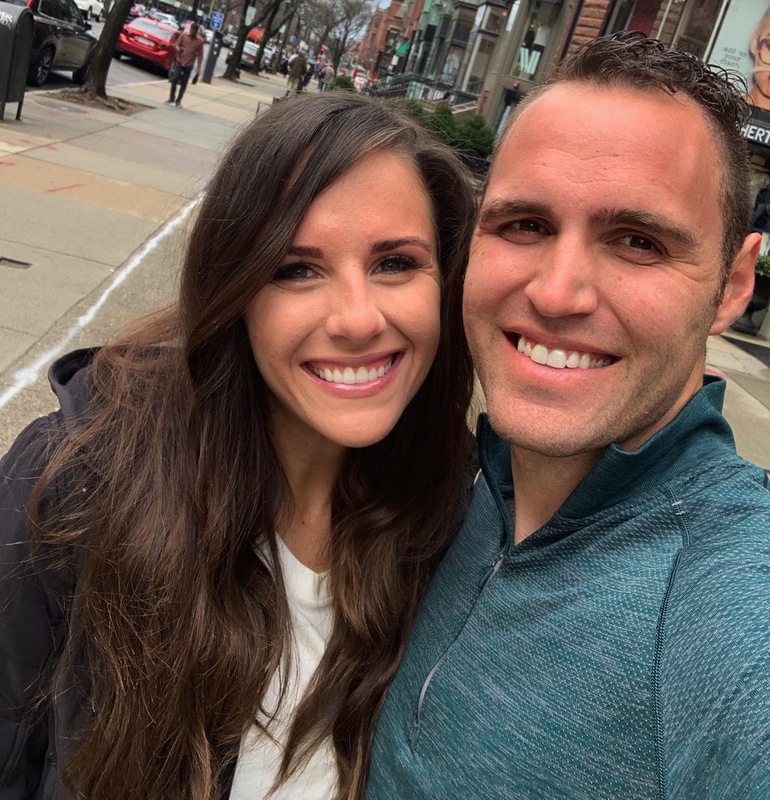 I love that you and Andrew got to take a weekend away together. My fiancé andd I love doing that and even if we spend the whole weekend together in town its something totally different exploring new places together and just being “you” guys instead of the whole crew! 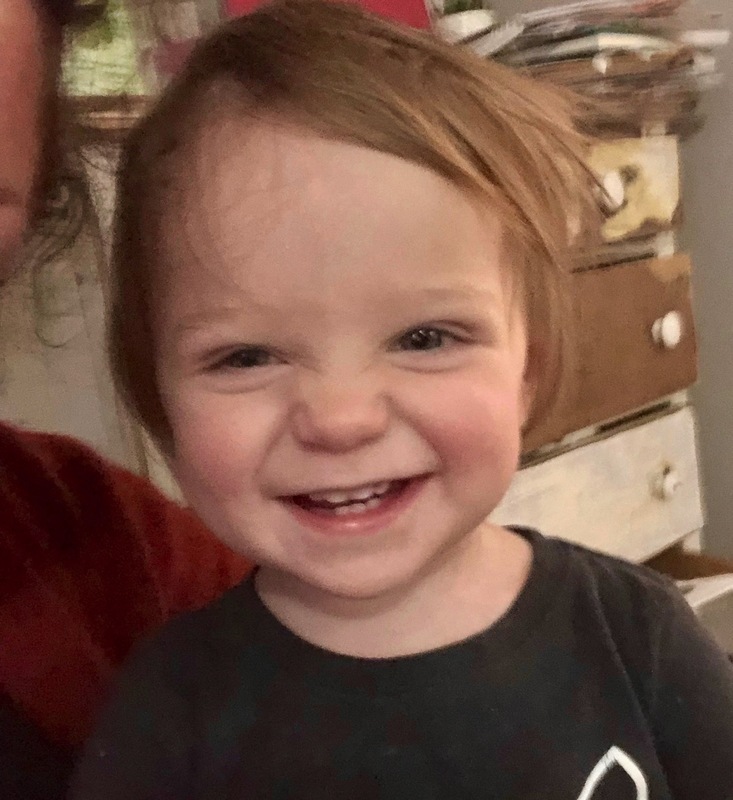 Have a great Wednesday and enjoy seeing Knox! I’M NOT ALONE… hahah have our tastebuds not matured since we were five years olds? I love it. I’m SO glad that you guys do that. It was seriously so amazing. I am really sorry about the foot pain. REST REST REST and I’m cheering for you. How thoughtful that was of you to think about how we get to see Knox today?! Wow, you are something else Eleanor! Have a wonderful day! So you got ice cream, but not from FOMU like I told you. I see how it is…..
Hahahah talk to Andrew… I was forced into siding with my husband on this one. Gotta plug Almond Breeze I LOVE their milk so much. I am a bit nervous to try banana though. What are your thoughts on banana almond breeze?! I used to collect beanie babies haahahah!!!! I still have a few of my faves around the house and donated the rest. Any chance you have tv show recommendations? Just finished This is Us and had a hard time getting into season 3. There is no bachelor/ette now so I’m lost! TOTALLY agree re: shake shack. their concretes are good, but the rest is just food. I’ve never had in & out, but i’m SURE i would love it. We should have tried the concrete!! In & Out is better in my opinion but McDonald’s fries have my heart forever;) . Have a beautiful day Jessica! Quick question about the Dove deodorant for chafing/blisters: Do you use the gel or the white stick? I’ve been using Vaseline which works but makes my clothes greasy and BodyGlide doesn’t seem to work for me. Just the white stick!!! I hope so bad it works for you! Glad the Dove deodorant works well for you! If you haven’t already, you should try Body Glide or Foot Glide. That stuff works wonders for me in preventing foot blisters and chafing, and has no scent or residue. 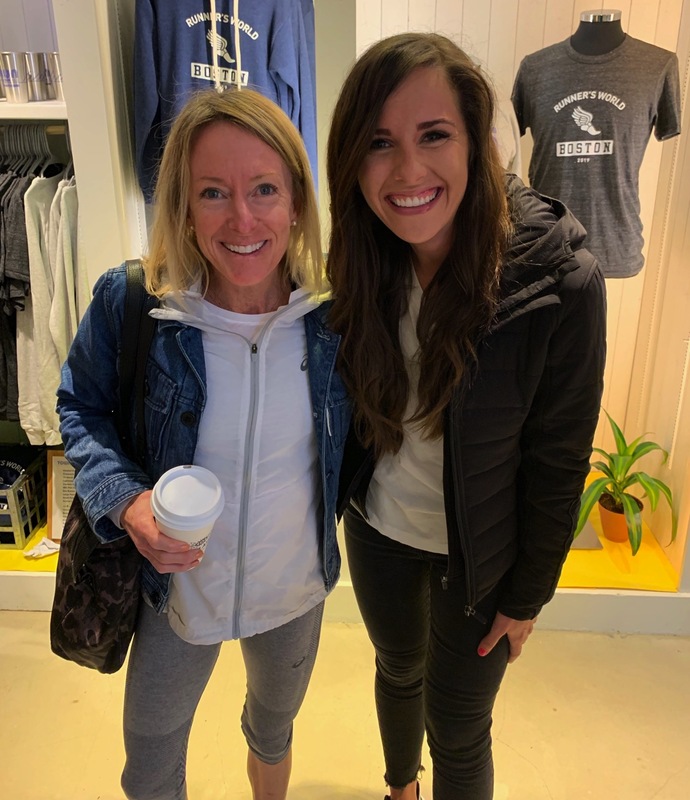 ONE post with both Deena Kastor AND Joan Benoit Samuelson? I collect Starbucks mugs from everywhere I travel to. My youngest collects comic books. I am not a huge fan of Cheesecake Factory. Today is a rest day with lots of walking since I’m still in Boston. Reading about all of you Boston adventures makes me crave that city! I definitely love collecting/holding onto race shirts. I wear them all the time as badges of honor! I also collect trucker hats to run it/wear around town. I didn’t realize it until my husband called me out on it! The last one I received came in a box and because of the weight and the noise it made when he shook it, he knew instantly what it was! My boys collect rocks and Pokemon cards. My little guy has just started collecting baseball cards; it’s probably the first thing he’s gotten excited about that wasn’t his brothers first! I’m pretty much a foodie and can find something everywhere. I don’t care for a lot of fast food though except Chic Fil A. My fam is not on board and I could probably eat it every day! My run today started out as a slow recovery run but as time went on, my run intervals (I did a run/walk today) became negative split intervals! Then, because I like pain, I went to the gym for leg day! I am in agreement with you..I had Shake Shack once and I didn’t find anything special about it at all..except it was overpriced, small, and overrated. Looks like you two had a fun trip!! So loved reading your recap!! I guess I am starting a Goodr collection, ha! They’re so awesome and you really only need 1, but i just bought more yesterday and now have 6 pair! A lot of people around here love our local Mexican restaurants, but I’d take Chipotle any day of the week over eating at one of them! I got in 8 miles this morning and am officially tapering for the Nashville Marathon in 10 days. I don’t have any expectations going into it because it is supposed to be hilly and hot. I am going to try to remember what you shared about Deena’s comment…”bring yourself to challenge and flex your optimism muscle so that it doesn’t atrophy!” Love it! Now, I have a couple of questions for you! :) About your Koala clip…where do you wear it? And, does it ever feel too heavy (with your phone in it) or cause any kind of chaffing? And, how do you carry your gels during a race? I know you’ve shared these things before, but I can’t remember what you said! Hey Kristen! Thank you so so much! And now you are making me want Chipotle right now. 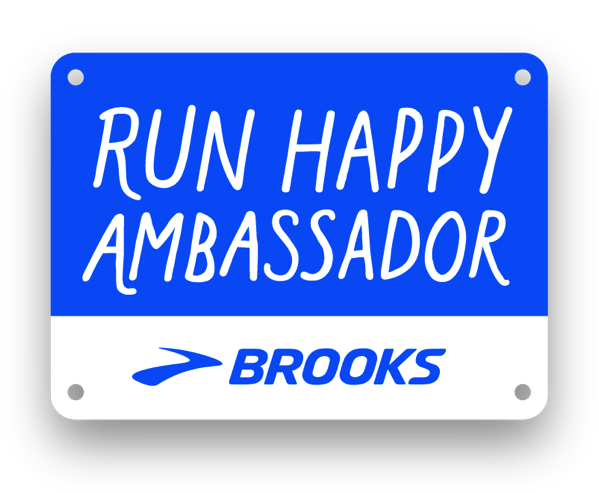 SO excited for you to run your marathon. Please let me know how it goes. I’m cheering for you! I have not chafed at all from my Koala clip and I don’t really even feel it. It just clips on to the back of your sports bra! I put my gels in my shorts (the Nike Rival 3″ have a bunch of pockets so I usually wear those). HAPPY TAPERING!!! Awesome! I think I might order one right now! :) I need to find shorts with lots of pockets!! Use the code HRG10 to get 10% off wahooo! Congrats again on your great Boston experience. I know you’re glad to be home though – having that glow on your face & sporting that medal … wear it with pride!! Great recap! I gotta day I was struck by you and Andrew being alone also (I guess we learn so much about you here it’s noticeable!) I was glad you two were alone together also – that’s very good to enjoy your spouse all over again and Boston is a great place to do it. You inspire me Miss Janae – I’m injured slightly just now with more walking than running but your posts are always a shot in the arm. Keep it up and yay!! I am OBSESSED with dogs! I’ve been known to take pictures of dogs I see along my race routes. My dream dog is a Golden Doodle! I currently have a 3 pound Yorkie named Cricket. She’s seven and I absolutely love her! I also have a six pound mutt who is the sweetest thing. Her name is Coco and she’s five years old and amazing. I never want to live life without a dog in it! 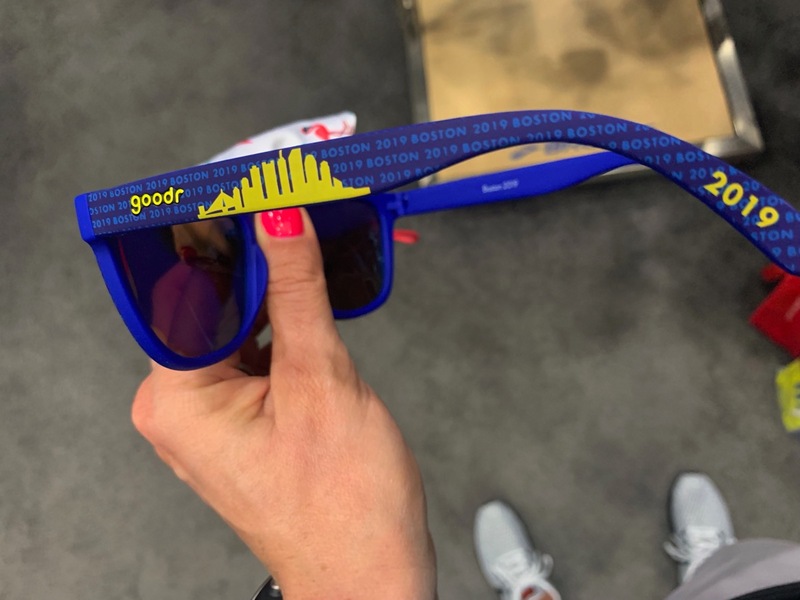 I am a Goodr sunglasses fan and those are COOL !! I just finished reading Deena’s book. How cool to meet her and get a picture with her !!! I wouldn’t wash that arm either. ha. I didn’t think I collected anything really until we had a “discussion” the other day when I gladly accepted another tri-pack of Burt’s Bee’s chapstick from my Mom. My husband had my daughter and I count all our chapstick/lipglosses. Not sure if I’m embarrassed or proud to announce we counted 63 !!! And every one is sacred, some are just emergency backups, then you do not touch the favorites ! (I know you get this, thanks for having my back). We have 2 dogs, both Jack Russells named Spencer and Toby. Both going to be 14 this year. PS – I have loved seeing all the pic’s with the people you saw and met !! So neat. Have anything you love to collect? Water bottles… it’s an obsession. What’s your run today?! Easy 2-3miles; nursing a wonky knee. Who has a dog? What is their name? Mulligan (Mully) is our 13 yo Soft Coated Wheaten Terrier. She’s 35lbs of fluffy snuggles. What did you do with the robe and PJ pants?? You got to meet ELLIE!? SO JEALOUS! my dogs name is Vaquita which means little cow in spanish (vaca), I found her in the woods when she was a baby and I was living in Peru – she was like a white cotton ball with black spots so i thought she looked like the tiniest baby cow!